A year ago, the City installed bike lanes on Cannon Street between Lottridge Avenue North and Gage Avenue North, skipping the two blocks between Lottridge and Sherman Avenue North, where the Cannon Protected Cycle Track ends. In late October, the City returned to Cannon to extend the bike lanes east from Gage all the way to the end of Cannon where it meets Britannia Avenue at Barons Avenue North. Cannon had two vehicle lanes in each direction for a low daily traffic volume - it's huge overkill. Now Cannon is one lane in each direction with a centre turn lane and painted bike lanes in both directions. This model of street redesign is emerging as a standard way to implement traffic calming on a four-lane urban street where traffic volumes are less than around 20,000 cars a day. The two vehicle lanes are enough to carry through traffic, while the centre turn lane stops left-turning vehicles from backing up traffic behind them. The bike lanes extend two kilometres from Gage to Barons Avenue North, where Cannon bends northeast along the path of the Pipeline Trail to merge with Britannia. Adding in the pre-existing bike lanes between Lottridge and Gage, that's a 2.5 kilometre stretch of bike lane. On October 24, Mark Rejhon reported on twitter that the bike lane suddenly narrows east of Kensington Avenue North, whereas the centre turn lane at that location is unnecessarily wide. In an email to RTH, Rejhon shared his measurements of the bike, vehicle and centre turn lanes at various points, noting considerable variation in their widths. Here is a table of the measurements Rejhon provided, converted to metric. We hope the City will repaint this section to ensure that the bike lanes are a safe minimum width. East of Ottawa Street North, the centre turn lane becomes unnecessary so curbside parking is retained on the north side of Cannon with the bike lane passing it to the left. This creates the potential for "door zone" conflicts where parked cars are too close to the bike lanes. The first vehicle I encountered was so close to the bike lane that an opened driver's side door would swing directly into the path of a person on a bike. At Ottawa Street, the addition of bike lanes has actually improved what was previously a fairly confusing intersection for through traffic on Cannon, due to the east and west sides of Cannon not quite meeting. With the addition of pavement lane markings across Ottawa, the intersection makes more sense for everyone. The westbound bike lane disappears for less then 100 metres approaching Ottawa and cyclists are indicated via sharrows to share the right-turn lane. I've written recently that Britannia would make an excellent cycling route, and the good news is that there is a plan to make this happen. That would produce a continuous route connecting to the Red Hill Trail and the pedestrian bridge across the QEW to the Waterfront Trail along Beach Road. According to Ward 4 Councillor Sam Merulla, "my plan is to extend the current bike lane beyond Britannia at Barons Ave to St Helen [Catholic School], which can connect you to both the trail to access the pedestrian bridge and Woodward [Avenue] and Melvin [Avenue] through the trail at the Urban farm." Merulla also plans to add bike lanes on Melvin, which will connect to the Britannia bike lanes via the diagonal trail running between Britannia at MacLaren Avenue and Melvin Avenue at Woodward. Woodward, in turn, already has bike lanes extending all the way to Beach Boulevard. Of course, I would have much preferred to see the protected two-way cycle track extended all the way, but This Is Hamilton™ and any expansion of the city's cycling network is a step in the right direction. I just hope the City used better paint this time. The bike lane markings added just a year ago west of Gage are already badly faded, especially past the new stadium. The other lingering issue is Cannon between Lottridge and Sherman, which for most people is a deal-breaking gap in the bike network. West of Sherman, Cannon Cycle Track comes to an abrupt end at the intersection, leaving people on bikes with no obvious way to proceed east through the intersection. I noticed that there are new west-facing traffic signals mounted on the utility pole on the pedestrian island at Sherman, and I got excited that this meant the City is planning on addressing this broken link on Cannon. Unfortunately, it does not sound as if staff have figured this section out yet. According to Daryl Bender, the City's manager for cycling projects, "We have investigated a few options to improve these two blocks for cyclists, but we have not developed a final plan." The traffic signals are to facilitate eastbound cyclists crossing Sherman, but they will merge into mixed vehicle traffic on the other side of the intersection. Bender argues that "traffic volumes continue to increase" as you move west from Gage and this presents a challenge for how to incorporate cycling infrastructure. However, as of 2010 Cannon was carrying only 10,800 cars east of Sherman. That volume can be accommodated easily on one lane in each direction with room for dedicated bike lanes. Unfortunately, it does not sound as if staff have figured this section out yet. Give me a can of white paint and I'l have it 'figured out' in the next hour. Dry Line Marker cart as tactical urbanism? (chalk powder cart that draws lines in sports fields...it'll wash away like sidewalk chalk but at least you can get away with chalk not being vandalism in many jurisdictions). Alas, this won't work well at Sherman-Cannon due to safety issues, but that tactical urbanism may work pretty well for painting a clandestine bike lane (and crosswalks / stop sign lines for increased safety, too) on Delaware Avenue for a good summer weekend. Few parked cars on a very wide street, makes it perfect and safe for a tactical temporary weekend bike lane. Cumberland (the official city bike route) isn't the favoured bike route, everybody likes to use Delaware instead (SoBi heat maps borne this out). Also, the fading bike lane on Stinson also needs to be re-painted (another tactical urban use of a Dry Line Marker Cart). Cumberland would be a much wiser choice for the bike lane markings for 2 reasons. Cumbertland is the designated bike route on the official plan and it doesnt have potential conflicts with a bus route as Deleware does. Cumberland is kind of out-of-the-way though. I'd assume that the LRT will bring such a complete revamp of the lower-city bus routes that the Delaware bus might go away anyways, especially west of Gage. I mean, if the LRT breaks King's traffic, then we'll likely see a 2-way Main. And if we've got a 2-way main, then why would the 1 use a different road in each direction? And if we're using Main, then the 5 is running only 200M south of the 1. 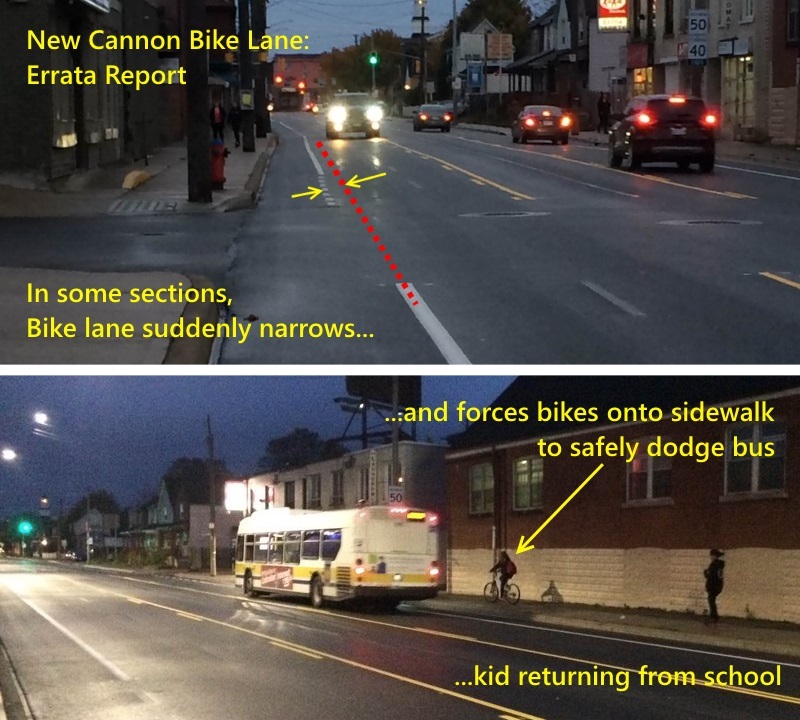 Consultants already told the city to kill the Cannon bus and most of the Strathcona/Kirkendall buses for similar reasons. and way less traffic on Cumberland. It should be a neighbourhood greenway. Low speed limit, speed humps and bike symbols. 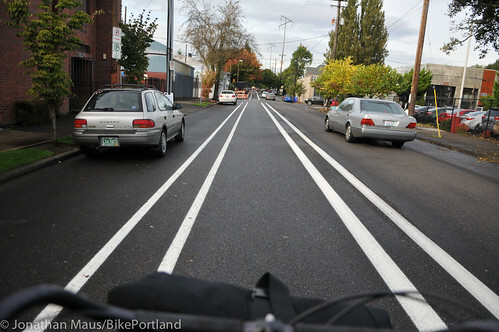 Two days ago (when driving) I noticed they painted a dotted eastwards bike lane through Sherman-Cannon. So now it's legal to continue biking eastwards it seems. At least that what it appears to be. Next time I bike/SoBi (warm November FTW!) I'll try its actual bikeability. Alas, looks like temporary sharrows (ugh) only for Sherman-to-Stadium. The eastbound painted lane now continues across Sherman, edging south around the island and then disappearing into the middle general traffic lane. Not a perfect solution, but better than previously. I don't have a picture. I saw a sharrow painted on Cannon somewhere between Sherman-Stadium. Forgot exactly where, perhaps when going westwards from stadium. So (drum roll) another new 4-block gap without a bike lane, just like Hunter-Stinson, Cannon-GagePark, Dundurn North-South, and many other examples. Tyyyyypical. Still a big improvement. Now we can easily bike crosstown in Hamilton via a simple route, something only daredevils used to do, now it's PG-13 Rated (we should strive for Family rated, though). A wonderful miracle that the Cannon Cycle Track (Shout Out to YesWeCannon!) got installed and I love it for my summertime SoBi+GO commutes (which occasionally still continues this month!) that allowed me to leave my car at home without increasing my Toronto commute time a single minute! Cannon east of Sherman was part of my usual daily commute route to work. Note the use of the past tense. Now I only ride on Cannon until the protected bike lane ends at Sherman. The City of Hamilton has created “Dangerous by Design” infrastructure in which the most dangerous place on the entire road to ride a bicycle is in the bike lane. I absolutely refuse to ride in a door zone, and strongly recommend that nobody else does either. Now I ride on Barton Street for this part of my commute. Yes, that makes me part of the 1% willing to ride without cycle infrastructure. So this is a “solution” that does not work for 99% of the population. Although objectively safer than riding in a door zone, there needs to be a high level of subjective safety before ordinary people will start cycling. Verdict: Infrastructure fail. Failure to comply with the CROW Design Manual for Bicycle Traffic. has created a dangerous situation. I'm fine with the majority of the extension (as much as I like to complain, it's generally an improvement for me) but yes, the door zone bike lane should have been moved to "parking protected bike lane" (behind parking lane) since passenger doors are less likely to open, and provides a buffer zone from moving car traffic. I sent the originals -- the non-annotated version of these photos -- to Matthew Green (who's been great with my emails) who I think forwarded them to the people responsible for the bike lanes. With a measuring tape, I scooted onto the road during long quiet moments, quickly measured each lane, in order to provide the listed measurements. I am curious why unidirectional turning lanes can be as narrow as 108" but bidirectional center turning lanes seems to apparently adhere to a minimum of 125" on Cannon (Even for very short sections where they can't be used as passing lane anyway) when I've seen them narrower elsewhere. That's 3.21 meters wide, over 10 feet wide. Almost two feet wider than regular turning lanes! Even if this was a truck route (it's not), trucks have to stay rightmost to do a wide left turn, so it's useless on Cannon to design the center turn lane to fit the width of a 18-wheeler truck! Kids live here, people...It's a residential neighborhood. It's probable painting staff are doing their hardworking jobs to unavoidably follow prescribed markings that are be following archaic minimum-lane-width rules that must need to be updated. But 125" wide center turning lane. On a residential road (minor arterial) that is not a truck route??!!?!! HSR buses don't even need that lane width, as has been shown elsewhere in the city. I've never been in a city that so desperately wants to be a big suburb. These centre turning lanes are such a waste of space. They are meant for car-heavy neighbourhoods in the suburbs, not old central city hoods where over 50% of residents don't own a car. They could have made nice wide, buffered bike lanes and only had left turn lanes at stop-lights. The street would have functioned just fine. Obviously satirical comment is missing satire tag. On a slightly related note, why the heck aren't there lanes separating pedestrians from cyclists along the beach trail at Confederation Park? I almost got ran over a few times by speeding cyclists. This. The Martin Goodman Trail in Toronto does this really well and I always thought that our portion of it (it's all the Waterfront Trail) should be of the same design. So I see a lot of homes with no driveways in the 3rd pic - a frequent concern with the "bike lane plus turning lanes plus two driving lanes" layout is the loss of off-peak street-side parking. Did they never have that there? Were those homes always parkingless? re: door zone. There are easy methods to give cyclists more space between traffic and parked cars. The city has to be willing to use 9 foot traffic lanes in some cases (Toronto and Burlington use them, but here it would cause mass mayhem apparently). my opinion on 'door zone' bike lanes changed dramatically a few years ago when I was in Portland and experienced the bike lane in the bottom link above. Small improvements can go a long way, but they only happen in cities who actually want a safe network for cyclists. Here, we want speeding cars and everyone else can figure out how to navigate around them. Nine feet is 2.74 metres. Look at the lane measurements Mark Rejhon provided - the city is already going that narrow at some points. where can I see those lane measurements? I see his data above with the insanely wide centre turning lane. Centre turning lanes can be 8 feet. 10 is ridiculous on a street like this. I went to these streets with a measuring tape, scooted onto the roads during quiet moments, and made the measurements which I emailed to several people, including RTH. For measurements/photography, I can be reached by email/twitter/etc by simply googling my full name. These are inside-edge measurements, from edge of painted line to edge. 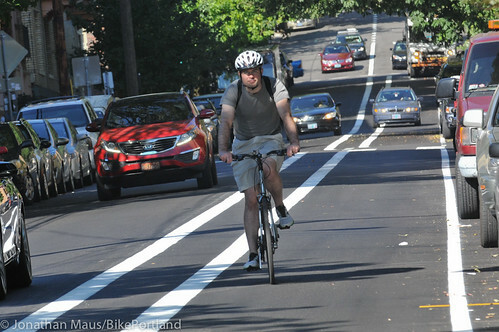 For example, including the thickness of painted lines, the center turning lanes are MORE than 125" wide. 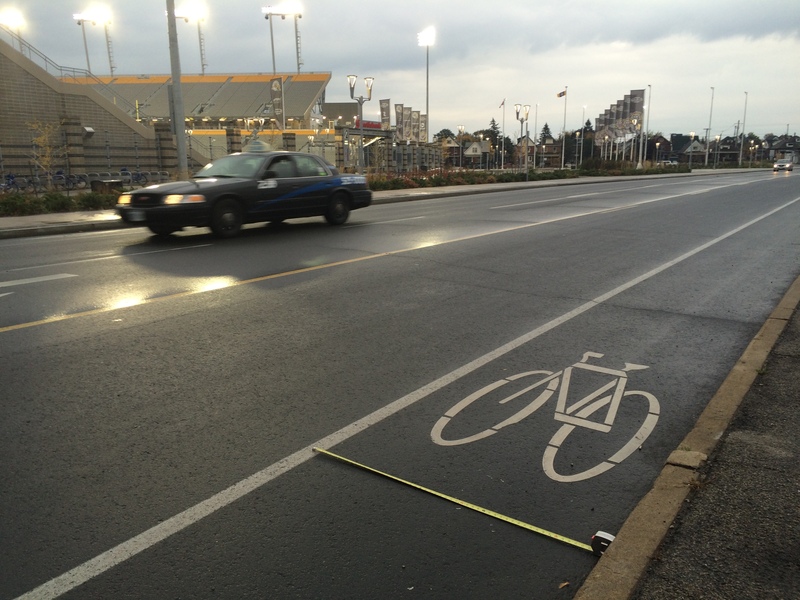 And photographic proof I did bring a measurement tape to the roads. I'm referring to the data above, which he sent to RTH in an email. The loss of a few mountain drivers is actually being replaced by more-than-proportionate increase in urban visitors. The downtown died a long ago but is revitalizing. 3 independent cafes just opened within walking distance of my Lower City home. Even an early canary of bright spots on poor old Barton, the 541 Cafe, is extremely packed with lineup on Saturdays at 11am. I'm a Toronto transplant, and amongst many, and honestly would rather use public transit / bikes / etc in the Lower City. The problem is we've got to go through a painful transition of reformatting the transportation for the Lower City, and transit-oriented developments, in order to really revitalize. What's already been done (e.g. James St N, International Village, etc) is only about 10% of what is going to happen to Lower City Hamilton over the next 20-30 years, also in parallel to LRT developments. It will, of course, indeed, be less attractive to driving, but residents that actually live nearby to these businesses, will more than make up. You see, Gage Park is actually within walking distance of Downtown Hamilton (I timed it: just under 40 minutes walk! ), yet very few residents walk/transit this distance. Unlike many other similar size cities who actually often do more walking and transit. It's so inhospitable and unenjoyable walking between these two points (walking an expressway or walking a zigzaggy route through alleys/residential neighborhoods) but that could no longer be once Main is a 2-way street, and the King LRT corridor. Small steps have helped, we've now got the Cannon Cycle Track (Which I use gradually more often now!) and it's now finally far more fun getting downtown without a car from where I live, 25 minute walk away from downtown. The transition can be quite haphazard, however -- like the difficulties of the Barton Village BIA -- to broken-gapped bike lanes -- to very poorly designed bus lanes that eventually got yanked -- but there are a bunch of successes, obviously (James, Ottawa, parts of IV, Arts crawls, Supercrawl, Locke, etc). Our neighborhood needs to keep up the momentum while also working with the rest of the city, including better transit connections to the mountain. well said. Curious, which 3 cafes are you referring too? I have a good idea where you live now thx to the Spec article. Lol Vintage Coffee is one. What are the other 2? Yes -- that was me and my spouse on the cover page of TheSpec. All within 10 minute walk. I have a feeling I missed 1 other place, but this is an otherwise incredible canary in a coalmine to see very lovely and busy cafes pop up right nearby shuttered storefronts and be a bright beacon/attraction in an otherwise depressed block that is about to attract new business. I'd go more often if Vintage Roasters was open late (Vintage Roasters tell me they are getting lots of demand from customers to be asked to stay open late on one (or two) weekday a week next summer e.g. 8pm Fridays) so I can go after work sometimes. And if you're not aware of 541 Cafe on Barton, you simply must go. It's busier than Mulberry's on James St N, very very incredibly popular especially during weekend brunches. It's right up there with the best, and even better than many top Toronto cafes, so out-of-place on Barton yet still cheap (And sometimes free; with the take-a-button jar for the financially constrained), but bodes well for Barton's future as a slow generational transition. Sterling 4.9 star place (Google), 4.5 star (TripAdvisor). The core is dying? Are you insane? Go to any half-way decent restaurant in the core on a Friday night or on the weekend...they're rammed. You and your friends would probably be better off at Milestones or Baton Rouge anyways. You're saying that in your little anecdote, your mountain friends refused to go to King and Ferguson because traffic in that area is bad, or because the core is dying. Neither of those things are remotely true, so forgive me for being bold, but I think that your friends on the mountain have other reasons for avoiding the area. My advice would be that next time they don't even waste time considering a restaurant downtown. Go to Burlington. Please.